Voldemorts Vault - Harry Potter Collectible Fan Site Message Board Forum Index -> November 2010 Harry Potter: Film Wizardry - Book Giveaway! Harry Potter: Film Wizardry is a colourful, interactive dedication to the Harry Potter film legacy, with highlights from the entire movie franchise. 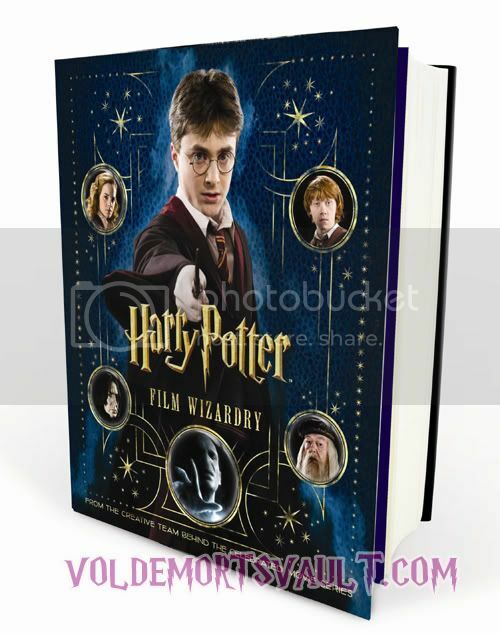 It includes Behind-the-Scenes imagery, the secrets how the ‘magic’ is made, an overview of all the most popular characters from the films, a look at the Harry Potter filming locations, and an explanation of the main aspects of the stories. The book includes many fold-out pages and pull-out options, including a sticker book on potion-making, the Marauder’s map and the letter sent to Harry inviting him to attend Hogwarts School of Witchcraft and Wizardry in a beautifully sealed envelope. The book is packed with photography and illustrations that accompany the informative text. Retailing at £25 in the UK, this book would make an excellent addition to any collection or bookshelf and thanks to the publisher we have an early copy to give away to one lucky VoldemortsVault reader! 1) Draw a copy of the book (either digitally or paper and crayons, pens, etc) anyway you want and post it in here! 2) Post a short story (under 100 words) of why you Love Harry Potter or Collecting Harry Potter Items! You can do one or both, maximum of two entries per person!